Wolves! It seems that Bungie actually consulted with wolf conservation groups before adding them in-game in order to make them as authentic as possible. Some of the wolf sounds we’ll hear may actually have been provided by real wolves cared for by these groups. Movie Making Artifacts! Eververse will soon be selling special cosmetic artifacts that alter your in-game camera filter with various tints, including sepia, blue, and a few others. We can’t wait to get our hands on them, or to see how the community at large puts them to use. They won’t provide any in-game advantage. Radiant Treasures! Although there is still no clarity on how Radiant Treasures will be obtained in-game, the indication is that they will be provided in a manner similar to Sterling Treasures . I’m not entirely sure about everything that you can get from those Radiant Treasures, but I know that among other things you can get visual customization options for your exotic weapons. I’m not sure if just some or if all of the exotic weapons have those new ornaments, but I saw options for the Zhalo Supercell, Invective, Telesto, MIDA Multi-Tool, and the new Khvostov, and I’m assuming there’s more. Emotes! While we’re on the topic of Eververse, Rise of Iron will also bring a new crop of Emotes. So far Bungie has provided a very solid collection and we’re looking forward to the next Carlton! Exotic Weapon Ornaments! The addition of new weapon and armor “skins” is something that many people have asked for since Destiny’s launch, and now this feature is inbound for real. So far we have confirmed that Exotic Weapon Ornamentation will include Zhalo Supercell, Invective, Telesto, MIDA Multitool, and the Khvostov 7G-0X. Ornamentation All Over! 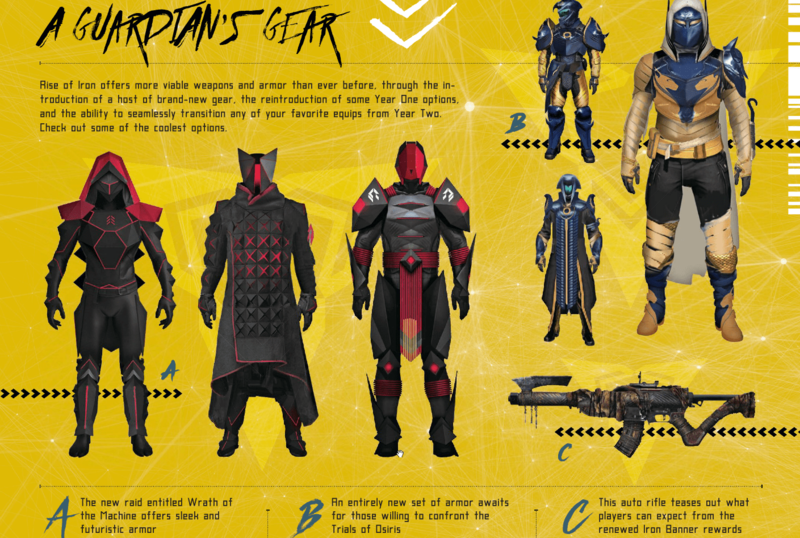 The new gear skins also include options for Iron Lord gear, Iron Banner gear, Flawless Trials gear, Raid Challenge Mode ornaments, and probably much more. Iron Engrams! We hear Lord Saladin will be selling Iron Engrams, which are rumored to provide Year 1 and Year 2 armor that may otherwise be unavailable or difficult to obtain. Finally, we can complete those Vanilla armor sets! In addition, Shiro-4 seems to be selling Year 1 Iron Banner Class Items at updated Light Levels. Stunning Views from Felwinter Peak! Lord’s Watch is an overlook of the whole zone that lets you see some areas you will actually visit on Patrol. It sounds like it might even give us a view of a massive grounded tanker that’s been torn open and has Fallen snipers hiding inside, although that could just be an area we’ll find while exploring the Plaguelands. Finding the Missing Ball! Remember those early images of the Cosmodrome that showed one of the colony ship’s spheres missing? We’ll find out what the Fallen Splicers are up to with it, and undoubtedly put a stop to it as well! Flaming Fallen Fortress! There’s a huge, burning fortress of Devil Splicers in the Plaguelands. It’s home to the new Archon’s Forge public event. If you don’t kill the enemies fast enough you can time out and not even make it to the boss. It seems like you need to be constantly dealing damage. Updated Public Events! New expansions have often meant new public events, and we’re looking forward to whatever Bungie has in store for us. We’ve already seen Perfected Walkers, the Flaming Battle Axe, and Shock Cannons – can’t wait to see what else is out there! Skeleton Keys! After each Nightfall or strike playlist completion, there’s a chance that a Skeleton Key will be rewarded. You can carry up to five of these keys, and they’re used to open the ‘Strike Hoard chest’ located at the end of any Strike. As long as you have a Skeleton Key, you’ve got guaranteed loot. New Lore! Every new expansion comes with new Grimoire, story, flavor text, and so much lore! We can’t wait to dig into all of the new backstory and secrets, including the origins and nature of SIVA, the real story of the Iron Lords, more Fallen culture and history. A Fallen foot soldier has to scavenge for a piece of SIVA technology to prove his worth to his House, and then he offers it up at the Archon’s Forge in order to earn the right to fight and improve his standing. So, in effect, when you find these SIVA pieces that trigger the start of a fight, you’re stomping all over the Fallen ascension rituals! Loot! So much loot… There are new loot chests hidden around the maps, and many are booby-trapped with mines and other “bad stuff”. We’ll get new guns, new gear, and new everything! New and Old Armor! There are also separate sets of Iron Lord and Iron Banner (more militaristic than Viking) armor, as well as Archon’s Forge armor and Wrath of the Machine armor set, new Trials gear, new Faction gear – everything is new! Then again, a lot of old stuff is also coming back at new Light Levels, so all our favorite Year 1 Class Items are back in the fold to complete our looks! New Guns! We’ll see new guns from all sources, including Iron Banner, Trials, Archon’s Forge, Wrath of the Machine, Faction Vendors, and random drops! Supremacy! If you’re like us, you can’t wait to defend your honor in the Crucible’s new game mode. Crests are supposed to represent your class honor, and taking those Crests by force is the only way to score. There’s also no sitting around, as Crests disappear after 60 seconds. The Return of Trials! Trials after the update has the potential to be very chaotic, with wide swings in light level giving a huge edge to those who grind early. As of now, there’s no announced updates or changes. Wrath of the Machine! Destiny’s newest raid is built on the themes of collision and mobility, with a variety of open, outdoor areas and explosive encounters that we can’t wait to spend hours exploring. Game Informer has also confirmed that Bungie will continue offering weekly Challenge Modes as in King’s Fall, in addition to Normal and Hard Mode, and that these Challenges may be a source of Raid Ornamentation. Strike Updates! The new Wretched Eye strike sounds like a huge step forward in design, with branching paths randomly generated on every run. We also have updated challenge in Sepiks Perfected and The Abomination Heist, plus the new Skeleton Key mechanic that gives us guaranteed Strike-Specific loot drops from the Hoard Chests that will appear upon completion. Exotic Quests! The return of Gjallarhorn and Thorn, along with new Exotic Questlines to obtain them, is something we’re can’t wait to learn more about! From the sound of it, the Gjallarhorn quest will resemble the Subclass Quests from The Taken King, taking us through new story missions and a special challenge mission in existing Crucible maps. With more new Exotics as yet unannounced, this is just one more car on the hype train that we can’t get enough of. Becoming Iron Lords! The new Rise of Iron record book will record our progress and achievements, and deal out new rewards for all classes at every step (yes, it’s account-wide), which is a great addition to the many ways Destiny now rewards us for our time. We’re already legends – now we’ll take on new titles to match these new challenges, and we can’t wait! What are you looking forward to most? Let us know in the comments!